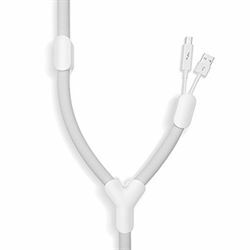 Soba zips loose cables up and consolidates them into a single tube that can be routed and affixed along walls, under desks, anywhere you have multiple cables running that you want to tidy up. Soba can accommodate large or small cables - up to three cables at once. Includes 10 ft. of Vortex tube, 3 mounting caps, 2 end caps, 1 y-split, 1 zipper tool.